One of my favorite mediums are color wash sprays - there are a variety of different ones available to crafters - two of my favorites are made by Ranger and Stamp Zia. You can make your own color wash sprays (mix dye based reinkers and rubbing alcohol in a spritz bottle) - however I've found them not to be as vibrant as the ready made ones. Here's a card I created using a morphed version of the Cling and Scrunch Technique (TJNL). Why "morphed" you ask? Well, it's a little creative altering of the technique so to speak. To start, I placed my watercolor paper into a shoebox and lightly spritzed using my Garnet Color Wash Spray, then quickly placed a piece of scrunched saran wrap over the ink - this not only spreads the ink - but will give you the lines you see in my finished sample. Once my color wash was dry (I cheat and carefully use the heat gun to speed up the drying time) - I removed the saran wrap, and black embossed my Iris image. 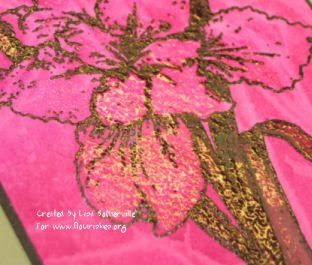 Using an aquapainter and watercolor crayons, I colored in the stem of the flower - then quickly poured on clear embossing powder while the crayon coloring was still wet, and heat set. This adds a bit of dimension to the image. For my iris, I simply used my aquapainter (no water color crayons needed here), and lightly went over the iris image, while wet, pour on the clear embossing powder and heat. ETA - Betsy at ISC is offering a special on the Adirondack Color Wash Sprays - preorder 4 get the 5th one FREE - just mention this special! Lisa, as always your work is impeccable. 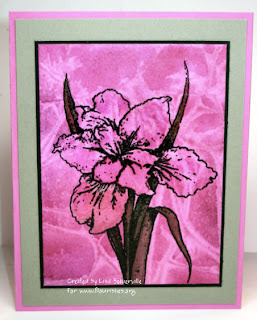 This Iris is beautiful and your embossing adds so much dimension to it. This iris is beautiful! I have a soft spot in my heart for the iris. It was my mom's favorite flower and she would have loved this one. This would have been the perfect Mother's Day card for her. I am trying to resist buying this stamp set, because how many irises does a girl need? But I don't know, I might break down, it is so beautiful and you have done a fantastic job of showcasing it!